IUCN program officer Emma Brooks discusses illegal wildlife trade in Vietnam and her research on how commercial farming of a traded species, like porcupines, affects both the species and the trade. She tells “The WildLife” host Laurel Neme how most animals in Vietnam’s wildlife trade end up on the plates of wealthy restaurant patrons. In Vietnam and elsewhere, commercial wildlife farming, meaning the breeding of wild species for legal sale, is often promoted to supply demand while preventing overhunting in the wild. 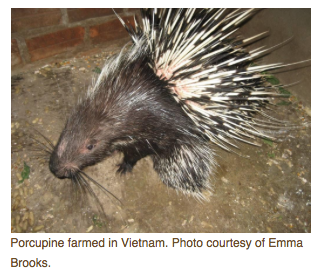 However, in a study on the conservation impact of commercial wildlife farming of porcupines in Vietnam published in August 2010 in Biological Conservation, IUCN program officer Emma Brooks concluded that commercial porcupine farming is instead having the opposite effect.